Nicolas Anelka says he is "neither racist nor anti-Semitic" after using his official Twitter account to defend a controversial goal celebration. 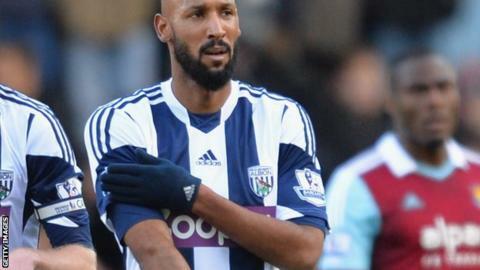 France's sports minister accused West Brom striker Anelka of a "disgusting anti-Semitic" reaction to scoring during Saturday's 3-3 draw at West Ham. Anelka made the "quenelle" gesture - described as an inverted Nazi salute. "Of course, I am neither racist nor anti-Semitic and I fully assume my gesture," Anelka, 34, tweeted. "The meaning of quenelle is anti-system. I do not know what religion has to do with this story." The French government is trying to ban comedian Dieudonne M'bala M'bala's shows over his use of the gesture and Anelka confirmed he did it in support of the performer. "This is a dedication to Dieudonne," Anelka said on Twitter. "With regard to the ministers who give their own interpretations of my quenelle, they are the ones that create confusion and controversy without knowing what it really means. I ask people not to be duped by the media." French Sport Minister Valerie Fourneyron criticised Anelka and the incident is being investigated by the Football Assocation. Fourneyron wrote: "Anelka's gesture is a shocking provocation, disgusting. There's no place for anti-Semitism on the football field." Albion caretaker manager Keith Downing said Anelka was "totally surprised" by the furore, despite the French government announcing on Friday that it was studying legal options to ban performances by Dieudonne. "It has got nothing to do with what is being said," Downing said. "It is absolute rubbish." Jewish groups had complained to French president Francois Hollande about Dieudonne's trademark gesture, which they described as a "Nazi salute in reverse". They linked it to increasing anti-Semitic remarks and acts in France. In return Dieudonne has threatened to sue the groups for calling it a Nazi salute. He calls it "la quenelle" - a word for a fish dumpling - and says it stands for his anti-Zionist and anti-establishment views, rather than anti-Semitism. Anti-discrimination body Kick It Out said it was in contact with partners in England and France over the Anelka incident and offered support to the Football Association in its inquiries. Former France international Anelka scored his first two goals for the club in Saturday's draw with the Hammers. He had not played since the 4-1 defeat by former club Liverpool on 26 October.